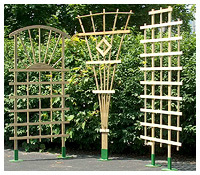 Country Craft's Gardener Trellis is pictured and designed to fit into our trellis box (sold separately), the trellis can support climbing plants, like roses or ivy, with an attractive lattice design. 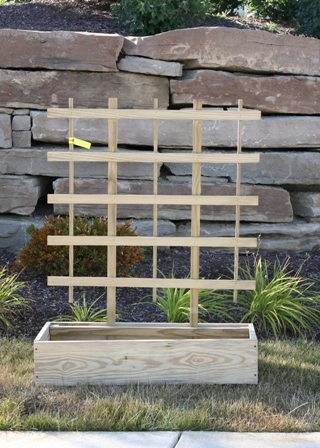 This trellis is also perfect for the back porch gardener providing support for your container gardening needs. Add color, fragrance and style to your balcony, deck or patio with our gardener trellis. As a set, the Gardener Trellis with the Trellis box is an excellent and economic way to add a touch of beauty to any backyard, pool area, front porch or apartment balcony.